it was one of my girlfriends birthday the other day and I made her this super quick card. 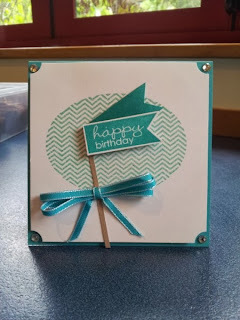 It was two stamps, I cut the two banners out at the same time and punched a 1/4 circle in each corner and placed on some bling and a triple bow! I love using background stamps like this one just to create a interesting feature. is on NOW so be sure to check out what's available HERE - you can order online directly (you get your order directly from Stampin' Up! or email me at julia.leece@vodafone.co.nz to add to my orders. You can order non Clearance Blitz items at the same time! Items are selling out and new items are being added to the list so keep checking it!! !